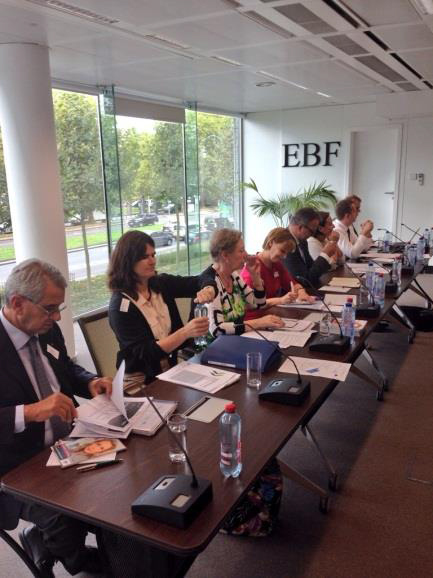 BRUSSELS/BELGIUM, 22 September 2014 – EBTN, the Brussels-based united voice of providers of education and training in the banking sector, lately convened a consultation seminar on the results of a European survey and the construction of the ‘Triple E Standard’. 60 professionals from the fields of banking, finance, science, education, policy, human resources and social affairs attended the meeting, hosted by the EBF - European Banking Federation. Mr. Wim Mijs, EBF Chief Executive, opened the meeting. “I am actually the result of you. Working on in a bank, is working with people” stated Mr. Mijs and underlined the importance of training and education in the banking industry. In his welcoming address, EBTN President Mr. Clemens Spoorenberg touched the mission of EBTN: becoming the standard-setting body for accreditation, certification and qualification of knowledge, skills and competences in the European financial services sector. “Transparent, professional education standards are an important ingredient” according to Mr. Spoorenberg. During the first part of the seminar survey results were presented and EBTN’s Vice President Mrs. Szymanska introduced the Triple E Standard. “We set ourselves an ambitious goal of developing a quality standard, the Triple E Standard, which is strongly related to EU-qualification benchmarks EQF, ECVET and EQAVET.” A panel of international experts responded to the progress of the project and the Triple E Standard in the second part of the seminar. This very fruitful debate was monitored by Mr. Simon Thompson, Chief Executive of the UK’s Chartered Banker Institute.